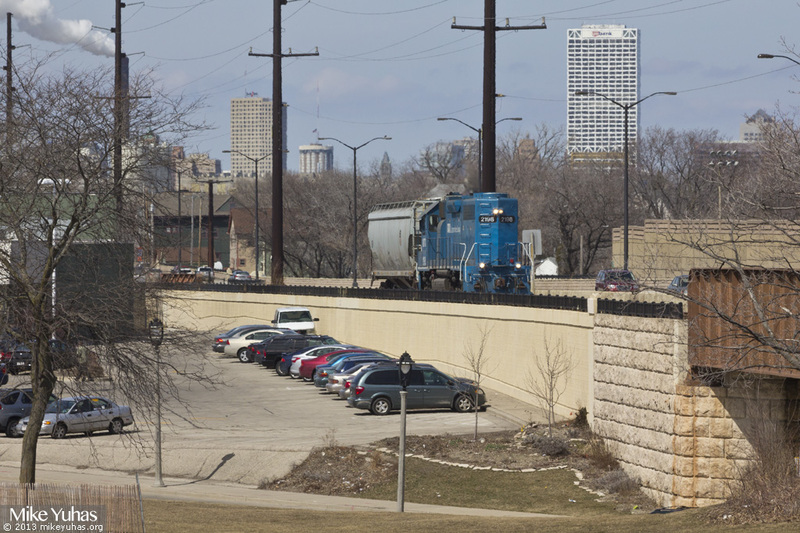 UP's Marsh job, LPA55, heads south on the National Avenue Spur at Kinnickinnic Avenue. Today was supposed to be a short, easy day for the Marsh job. On the way here from Butler, the engine developed problems, at one point only making 4 MPH. Engineer Dean finessed the unit so they could complete their switching, but said he'd prefer to return home to Butler light, rather than risk stalling with a good number of cars. And later, after arrival at the Port of Milwaukee, the job derailed on Jones Island. A crane was called to lift the affected covered hopper back on to good rail. It is being back to Butler to undergo a thorough inspection.